A unique guide to self sufficiency and survival strategies for life immediately after disaster strikes. 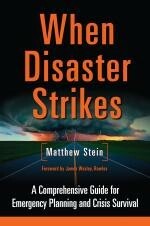 This book by Matthew Stein, compiles instructions and techniques to help you prepare for and survive natural and man-made disasters. A practical guide to preparedness featuring specific lists and instuctions addressing both pre-planned preparedness, including essential survival supplies and approaches, as well as improvised and natural non-commercial solutions to surviving after a disaster.